The year after I graduated from college, I lived in an apartment in the West End of Richmond, VA. There was a public library about a half mile away from my apartment. Occasionally I would walk to the library, but it was an unpleasant experience. In that half mile, I had to walk along two busy roads, neither of which had a sidewalk. Like many parts of cities that developed in the United States after World War II, the West End is primarily designed for automobiles, not pedestrians. “If you want to go to the library,” the city planner is telling you, “you’re supposed to use your car.” Even if the library is only a half mile away. Following my time in the pedestrian-unfriendly West End, I lived in three places that were much more pleasant to walk in: Prague, Czech Republic; Budapest, Hungary; and Vancouver, Canada. In the six years that I lived in those places, I did not have a car. I didn’t need one. With the help of public transit, I was able to go everywhere I wanted to go on foot. 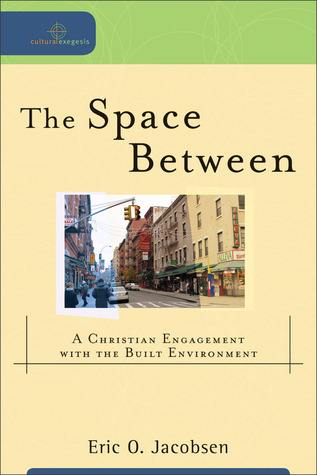 Being a Christian who recognized that my quality of life was affected by how different places I’ve lived were constructed, I was eager to read The Space Between: A Christian Engagement with the Built Environment by Eric O. Jacobsen. Jacobsen is a pastor who has done a lot of thinking about what human-made elements make a place pleasant or unpleasant to live in (you can read an interview with him about the book here). This is his second book on the subject, his first being Sidewalks in the Kingdom: New Urbanism and the Christian Faith. Not having read the earlier book, I’m not competent to say how they differ. I can only say that this one is longer than Sidewalks in the Kingdom, and while it does talk about New Urbanism, that is not the primary subject. It seems broader in scope. Jacobsen sets out in this book to introduce the built environment to the Christian community, and to make the case that Christians ought to care about creating built environments that lead to human thriving. The book comes in three parts: The first part is Orientation, in which Jacobsen asks readers to think about who they are, and how they are situated in space and time. His primary audience is North American, and he gives a lot of history on how and why North America has been built in the way it has. The second part is Participation, in which Jacobsen asks readers to think about the different agents who enact community life in a particular place: families, political groups, and churches. The final part is Engagement, in which Jacobsen challenges his readers to ask hard questions about how their Christian faith ought to interact with the built environment, creating places that are sustainable and loved. This is a book both for those who already know and care about the built environment, and for those who have not thought about it much, but are curious. I fall into the latter camp, and over and over again I found that Jacobsen gave me language to name things that I already felt. I knew that certain built environments made me comfortable or uncomfortable, and now I know more why that is. It could be a challenging read at times, since a lot of the vocabulary was new, but it was worth the effort. Jacobsen’s chapter on sustainability was challenging in a different way; some of what he writes about human thriving, environmental stewardship, and justice will challenge assumptions held by some of his fellow Christians. That, in my opinion, is a good thing. For people in my generation, “The Space Between” is, first and foremost, a Dave Matthews Band song. But it is now also a welcome invitation for Christians to form convictions about how their faith should affect the built environment, and begin to act on those convictions. Not everyone will have the time or the ability to make large-scale changes in the places where they live—after all, the built environments we live in now have taken shape over generations, and sin is present with us even as we seek to build better places to live. But everyone can begin to make small changes that help to “seek the peace of the city” where God has placed them (Jer 29:7), as we ultimately look forward to the city “whose architect and builder is God” (Heb 11:10).